At Gametize, we’ve designed our very own 5D Framework & Scorecard as a guide to building and implementing a gamification strategy. 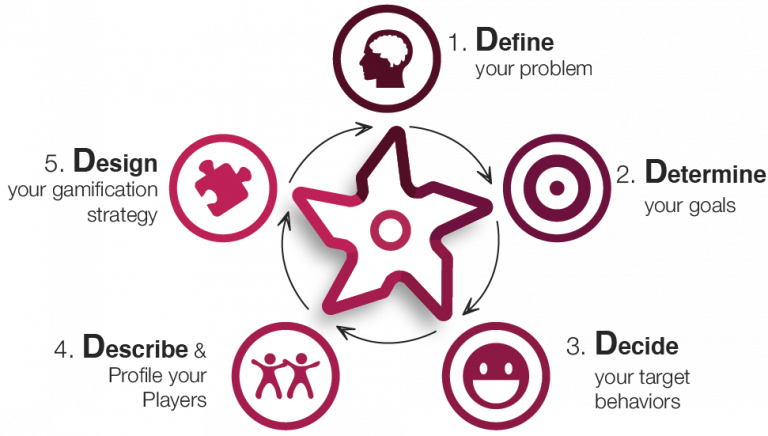 We’ve devised this based on our experience and have found this foundational framework essential for seeking problem areas, building solutions, and catering to the needs of players. We hope you’ll find the 5D Framework as useful to you as it is to us! (Though if you are already a Gametize 5D ninja, just skip this altogether and go straight to Gametize Scorecard below). Let’s get real here: what’s bothering you that you think gamification can help with? Are you able to draw a fishbone diagram so you can figure out what are the root causes of the problem? Retention of knowledge is 10% after every workshop. *Side note: Let’s call a spade a spade. Don’t fall into the trap of “I don’t have a problem, I just want to make something better”. If you don’t have a problem, you are actually looking to solve nothing…you may as well put your money under your bed instead – you’ll instantly get a better ROI a year from now! Being realistic and honest is the first key step to creating a meaningful gamificaton campaign. You definitely aren’t doing this because it is fun or you want to make the world a better place. Once we have identified our problems, we need to seek out end goals: goals create focus and maps out the path for your strategy. Let’s talk about quantities here. Don’t fuss too much on this, and determine some numbers here that would make you a very very happy person. Make sure they are achievable! 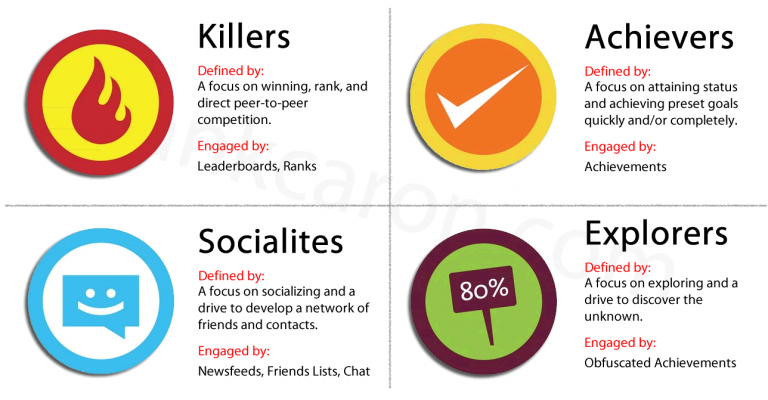 Target behaviour is more qualitative and defines the types of behaviour we want to see players carry out. Take for instance, exercise: when we develop a positive attitude towards exercise, it can help kick start a rewarding regime, enabling better health. What are the behaviors that can help you solve the problem, conquer the root causes, and get to the goal above? "This is a rewarding game where I can win surprise prizes!" "I never thought this new skill I'm learning is so useful!" "The company makes me feel recognized and exclusive"
"I could actually improve other people's lives by contributing in this game"
"I know much more about myself now"
This is a general profiling of your target audience. Describing your players enables you to create appropriate content for your game. Ask yourself: Who are these players? What are their player types and what motivates them? *Side note: Do not proceed if you haven’t tackled these questions. Otherwise, well done! Now that you have these pieces of information, let’s go on to design the Gametize experience, based on the following scorecard. You don’t have to hit a perfect score, but these are questions that you should keep in mind. What can the 5D Framework be used for? The 5D Framework & Scorecard can be applied to a diverse set of use cases, from setting productivity goals to social relations. This post was contributed by Keith Ng, Prapim Chutaprutikorn, and Max Ang. Max Ang was a Business Development Mentee at Gametize in 2014.He loves reading, especially on themes that deal with the modern society. A sporty person who enjoys runs in the morning and rock climbing on the weekends.